Note: check the latest travel warnings before booking your trip to Tunisia. Tunisia is a year-round destination, but if you're heading to the north, the best weather occurs between May and October. In the Sahara, summers are typically scorching and those with a low tolerance for extreme heat may prefer to travel during the winter (November to February). With its safe, laid-back vibe and incredible heritage, Tunis is a great place to start your Tunisian adventure. Spend the day exploring the winding streets and souks of the medina, or admiring Roman ruins at nearby Carthage. The French Ville Nouvelle quarter has many excellent restaurants while the Bardo Museum houses some of the country's most famous ancient mosaics. 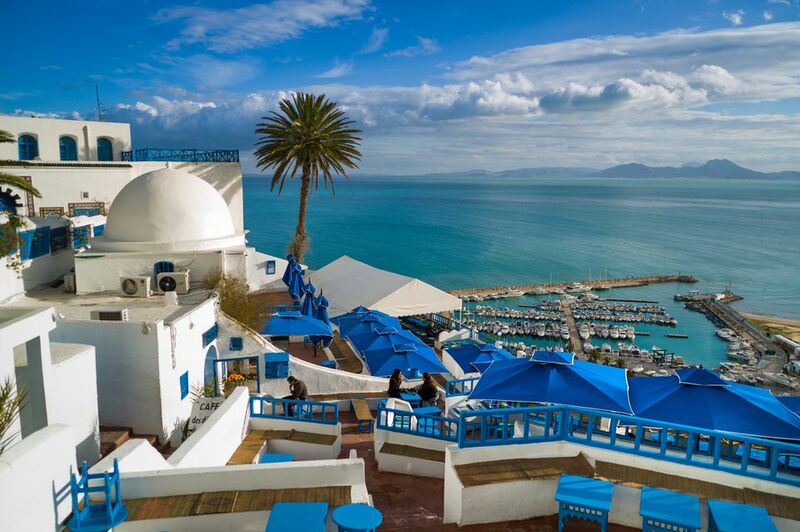 With its white domed houses and blue-painted doors, the clifftop town of Sidi Bou Said is Grecian in its beauty. Visitors come to admire panoramic Mediterranean views and to explore a plethora of art galleries, boutiques and open-air cafés. To discover the history behind Sidi Bou Said's unique architecture, visit the Neo-Moorish home of Baron Rodolphe d'Erlanger. Comprising 40,000 square kilometers of pristine desert, Tunisia's section of the Grand Erg Oriental is a wonderland of sweeping dunes and hidden oases. You can choose to explore by 4x4 or as people have done since Biblical times: on the back of a camel. Keep an eye out for rare desert wildlife and revel in the splendor of wilderness sunrises and sunsets. A 2.5-hour drive south of Tunis takes you to El Jem, a Punic city that became an important center of commerce during Roman times. Today it is home to some of the best-preserved Roman ruins in the world, of which the most famous is the UNESCO-recognized Amphitheatre of El Jem. Built in the 3rd century, this magnificent monument once hosted 35,000 spectators. The main port of entry for most overseas visitors is the Tunis-Carthage International Airport (TUN), located in the capital. It is served by many different airlines including Tunisair, Air France, Lufthansa, EgyptAir and Royal Air Maroc. At this time, there are no direct flights to Tunis from the United States. Visitors from many countries including the United States, Canada, the United Kingdom, Australia and New Zealand can enter without a visa for a stay of up to 90 days. In addition to ensuring that your routine vaccines are up to date, the CDC recommends that travelers to Tunisia be vaccinated for hepatitis A and typhoid. Depending on your planned activities, some travelers may want to consider rabies and hepatitis B injections as well. There is no risk of malaria in Tunisia.